This Thursday I went to my very first theatre performance that wasn’t held in a school auditorium–it was held in a cinema… lol! The National Theatre Live broadcast of Hamlet, starring Benedict Cumberbatch as young Hamlet, was playing in my local movie theatre and I jumped on the opportunity to watch it. Because, really, what’s better than popcorn and a play? The creative decisions in set design and wardrobe stood out in the play. Both Hamlet and Ophelia were often dressed in Mad Men-era clothing, Ophelia had an old-school SLR strapped to her neck almost the whole length of the play, telephones were often used by the ensemble in the backdrop, and Horatio looked quintessentially hipster all the way through, flaunting his beanie and spider web elbow tattoo. And Gertrude’s dresses!! To die for. Simply stunning. Classic Shakespearean dress was usually used either in jest or during the play Hamlet holds within the play. Unlike the abominable 1996 screen adaptation Romeo + Juliet, these additions were subtle instead of garish. An interesting but overall appealing visual production. Now I start raving. Ready? OMG, I ALMOST DIED AT THE END OF ACT I!! Right before the intermission, Ciarán Hinds as King Claudius makes this bone-rattling speech about his plans for Young Hamlet, how he’s sent him off to England only to be killed on orders from the King. And right at the apex of his speech, before the curtain falls, there’s a loud boom that shakes the room and the stage erupts in what looks like black gunpowder and ash, exploding onto stage from stage right. I thought for sure that the director had deviated from the script and was implying that Claudius had blown up the ship instead of having Hamlet quietly killed. In the world we live in, honestly, it would have been an extremely powerful and relevant adaptation of the murder plot. It would have immediately labeled King Claudius as the ultimate terrorist in our minds. But, alas, ’twas not to be. ‘Twas better. When the curtain rose at the beginning of Act II, I couldn’t stop grinning at the pure genius of it all. I had expected the black dust to have been cleaned up and pushed off stage during intermission. Instead, the whole second act was held among mountains and mountains of the stuff. Chairs were haphazardly toppled to the sides as if thrown from the explosion and the cast walked upon the ashes, oblivious to it. 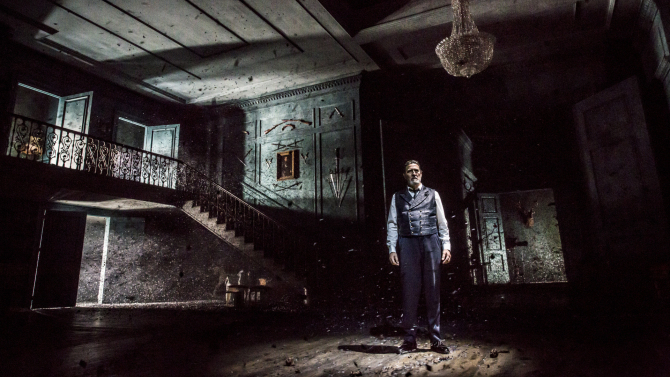 The dark debris was a symbol of the shattered state of mind every character is living in through the end of the play. Brilliant. Beautiful. Tragedy. It was perfect. Okay, now that I’m done raving about that… let’s talk about the acting! I thought I would be fangirling over Benedict Cumberbatch the whole time–and he was brilliant!–but several other characters stood out as well. Ciarán Hinds as King Claudius was amazing. His repentance attempt is still replaying in my mind; i felt so badly for Hamlet when he decided against killing Claudius in that moment, especially when Hinds delivered the lines “My words fly up, my thoughts remain below: Words without thoughts never to heaven go”. Sian Brooke’s Ophelia brought me to tears as she wandered off to her death. Her sorrowful song… 😥 However, the resemblance to Zoe Deschanel was so strong that it took me a while to figure out they weren’t one and the same. Finally, we come to Mr. Cumberbatch. I thought he was over-doing some of his dialogues in the beginning–he would randomly start shouting at the top of his lungs and I couldn’t understand why–but as the play took in its own rhythm, so did he, it seems. Now, I’ve read Hamlet but I never found very much humor in it except for the occasional jab at the dim-witted Polonius. Cumberbatch, however, did a marvelous job of finding humor where I would never have seen it. He had the audience both in theatre and in cinema in an uproar at times. His every monologue was a thing to behold. The desperation in his eyes during “To Be or not To Be”, his rage while delivering his plans for revenge against Claudius while Claudius is kneeling to pray, the aching in his speech of his love for the now-dead Ophelia; the acting feels so true you can see nothing else in those moments. When scenes weren’t as intense though, something I couldn’t help but notice was that he was sweating… A LOT. It was kind of gross. He’d soaked through his shirt halfway through Act I and I’m pretty sure the new shirt he changed into was some crew guy’s from behind the scenes… lol. Why, look you now, how unworthy a thing you make of me! You would play upon me. You would seem to know my stops. You would pluck out the heart of my mystery. You would sound me from my lowest note to the top of my compass. And there is much music, excellent voice, in this little organ, yet cannot you make it speak? ‘Sblood, do you think I am easier to be played on than a pipe? Call me what instrument you will, though you can fret me, yet you cannot play upon me. 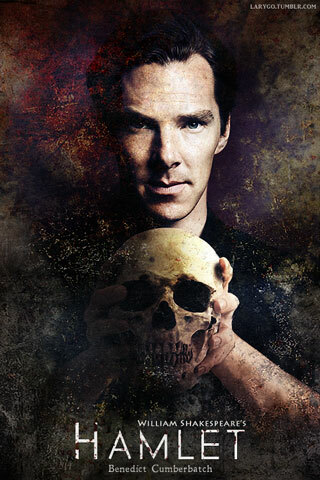 At times Hamlet seems completely in control of himself–mostly seen this way in his monologues with a few exceptions–while other times worries us with strange acts of irrationality. And one will follow the other, there is no steady decline into madness, just enough of a randomness to keep us as involved as the other characters in trying to figure out if he’s gone mad or not. A stellar performance by Benedict Cumberbatch, without a doubt. Did you catch your city’s showing of Hamlet? If so, what are your thoughts on the end of Act I? Let me know in the comments! P.S. 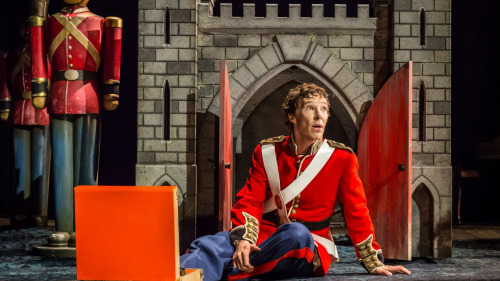 Dear Reader, please donate to http://www.savethechildren.co.uk/hamlet to support the aid efforts of Save The Children for the Syrian refugees. This is a request straight from the mouth of Mr. Cumberbatch, given at the end of the NT Live performance. Thank you. This entry was posted in Literature, Movie, Uncategorized and tagged Talk Nerdy To Me. Bookmark the permalink.